(L-R) Femi Afuewape, Minabere Joshua (Secretary); Iye Egbuna, Mrs. Eniola Williams, Engr. E. Ngini and Munir Umar; all members of the Nigerian Ports Authority Anti-corruption Unit during their swearing in Lagos on Friday. The Managing Director of Nigerian Ports Authority MallamHabibAbdullahi has declared a zero tolerance for corrupt practices at the nation’s seaports. Speaking at the formal inauguration of members of NPA Anti-Corruption and Transparency Unit (NPA-ACTU) in Lagos, the Managing Director represented by the General Manager, Western Zone MsAdenikeSonaike added that for NPA to be the leading Port in Africa, and to improve her efficiency level, the issue of corruption cannot be down-played as corruption is inimical to efficiency in the port industry. The Managing Director also said that if Nigeria must take her pride of place among the committee of nations then we must shun corruption and, declared that the management is prepared to stamp out any corruption which informed its reason to establish branches across the ports. In his own statement, the representative of the Honourable Minister of Transport Sen. Idris Umar, Mr. KayodeOlajimi affirmed that NPA-ACTU is a pacesetter which other parastatals and the Ministry look up to, NPA as the first ACTU to be inaugurated among the MDAs in the Ministry of Transport. According to The Head of Independent Corrupt Practices and other Related Offences Commission (ICPC) Lagos office, Mr. Olufemi Nofiu asserted that his office had a cordial relationship with NPA-ACTU in the past. Mr. Nofiu enjoined the management of NPA to give the new executive all the necessary support so they can continue the good work. 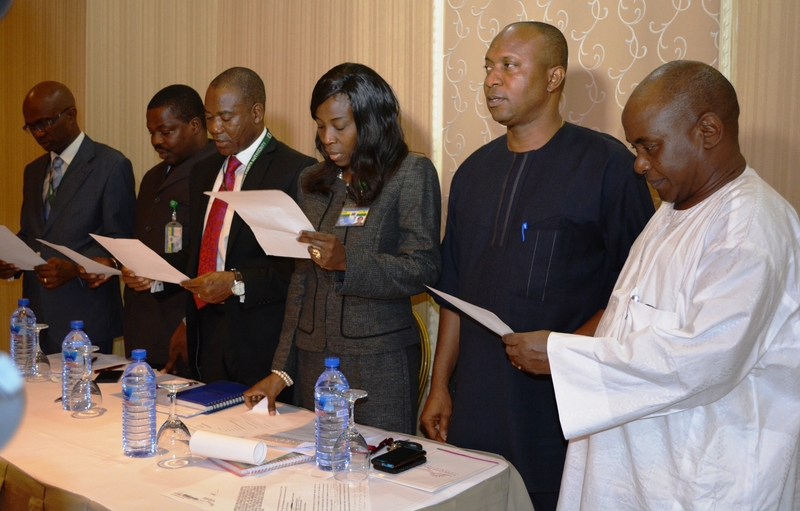 He assured the new members of all the support they may need from ICPC. Members of NPA-ACTU Unit consist of Mrs. E.I. Williams as the Chairperson, while members are G. IyeEgbunu, A.M. Aliyu, Engr. C. Ngini, MallamMunir Umar and Joshua Minabere as the Secretary. The terms of reference of the unit include among others:-receive and investigate complaints of corruption and other sharp practices, educate staff on and against bribery, corruption and sharp practices and monitor the Authority for general compliance with the Anti-Corruption and Transparency crusade of the Federal Government. It would be recalled that the monitoring Unit derives its power from the provision of the Independent Corrupt Practices and Other Related Offences Commission (ICPC) Act of 2000 and the government of the Federation’s approval for the establishment of Anti-Corruption and Transparency Monitoring Units (ACTU) in Federal Ministries, Extra Ministerial Departments/Agencies and Parastatals. Present at the inaugural ceremony are General Manager Administration Chief M.K. Ajayi who represented the Executive Director Finance and Administration, General Manager Human Resources Alhaji Abba Rufai and General Manager Business Development and Joint Venture Mrs. Ugo Madubuike and other staff of the Authority.